An important aspect of routine actions is time. Usually most of the actions that are done as a daily routine are connected to time – either that they are being done on a special time of day or that they have to be accomplished in a certain amount of time. Day 9 – and it’s already getting hard…. Today was very busy, I finished only one little sketch in my sketchbook. Cranberries. 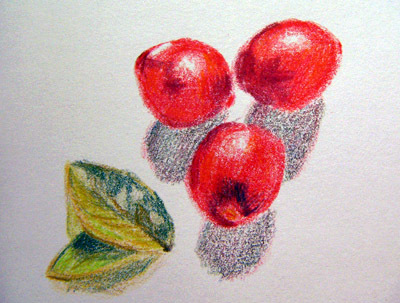 (I think they also qualify for EDM challenge 178 – draw something red and for IF – sour) Cranberries, what are they actually good for? They are said to contain many vitamins, antioxidants and other chemical components that make them beneficial for the immune and the cardiovascular system (more information). Many people use them for cooking as far as I know, but I haven’t done that until today. Still looking for a decent recipe. Day two of the NaBloPoMo has arrived. Today’s card has the title “Ace of Chocolate”. Yes, it’s a delicious piece of almond-nougat wrapped um in some golden paper. No, actually I should have said that it was a delicious piece of chocolate, before I left it in front of my window where the hot sun melted it completely this afternoon 😦 . What would you say, does chocolate qualify as food? Some people regard it as semi-luxury food, others try to avoid it completely because of health reasons. On the other side, there are some scientists claiming that dark chocolate is good for your vascular system and your heart. So maybe it isn’t that bad after all? Another little ACEO. 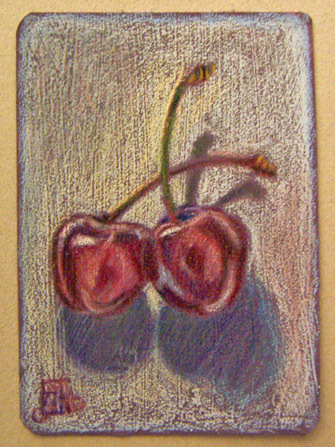 Colored Pencil on a pastel-ground primed card. Yes, I know that most serious people would just cut their paper/board to fit the card-size, whereas I like to take original playing cards and prime them with primer to get a nice support for drawing 8). Since I neglected this little blog of mine so badly over the last weeks, I’ll try to do better this month. That’s why I decided to join NaBloPoMo this month. 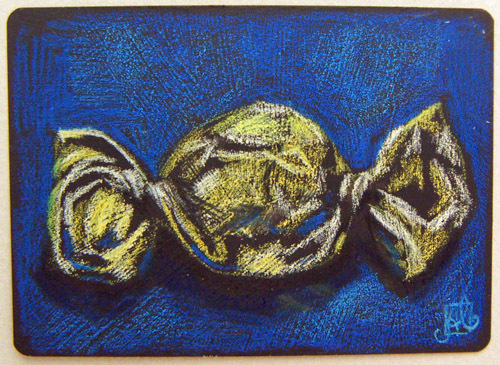 I’m going to paint or draw one little ACEO every evening. The main theme will be “food”. I hope to be able to keep this thing going till the end of this month. C U tomorrow! Hmmm…I said that I would finish this one today and I think it’s finished now. Perhaps I still have to tweak it a little bit, but I call it done for now. It’s time to move on with the acrylic painting again :). 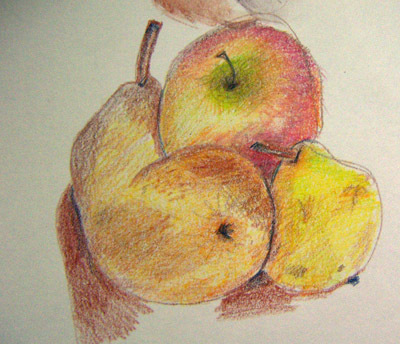 You are currently browsing the Colored Pencil category at : silviasblog.com :.